How many pivots make a full circle? Ask Honestly, previously Unvarnished.com, now Talentbin. You following? The company started as a Yelp for people, but quickly realized it was difficult to crowdsource reviews of humans from other humans. LinkedIn isn't exactly teeming with recommendations (and half of the people who have made them wish they could call takebacksies). It had the potential to become a pit of defamation and was maybe a little evil, too. So it's no surprise that an online vouching social network type of hybrid was a challenge. Now the company has relaunched as a more recruiter-friendly LinkedIn. 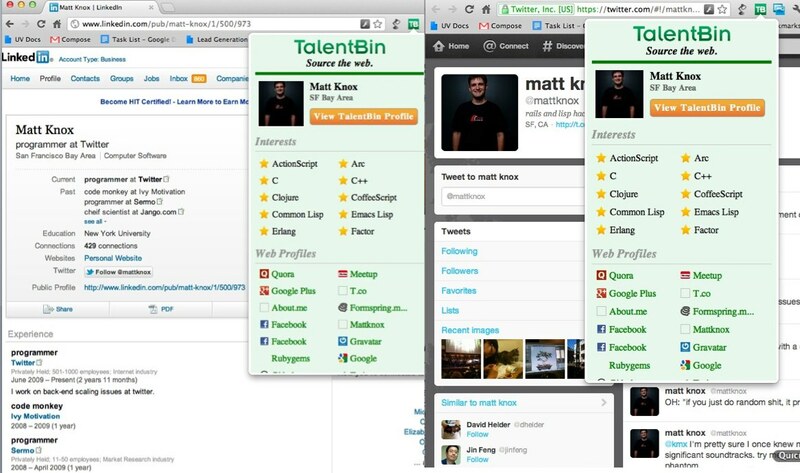 Called Talentbin, the site gathers info from publicly available profiles from Twitter, Facebook, LinkedIn, and also Meetup, Quora, Github, Stack Exchange and other industry-specific social networks. It aggregates that information in a useful way and presents it to recruiters, who pay $499 a month for access. That's around half the cost of LinkedIn's professional recruiter product, which allows headhunters to send messages to prospective job hunters on the service. Most of Talentbin's customers subscribe to both services. "They look at (Talentbin) as being a LinkedIn Recruiter, engineering rocket fuel edition," says CEO Peter Kazanly. The idea is that LinkedIn profiles are typically lacking in many relevant details a recruiter would love to have when surfacing candidates. Mine is fairly sparse; it's rare to find one outside of sales that isn't. Currently Talentbin is focused on the tech industry. It's gathered 60 paying clients, which includes large companies like Intuit and Groupon as well as brother and sister startups within First Round Capital's portfolio. The firm invested $1.2 million in Unvarnished-Honestly-Talentbin in 2010. The challenge will be to expand the product beyond tech recruiting. "We've proved that it works within this discipline and it feels intuitively correct that it works in other industries," Kazanly says. "It comes down to, 'Do people in that discipline kibitz with each other and do they do it online?" If they do, he says, Talentbin will sniff them out and bring them awesome opportunities.